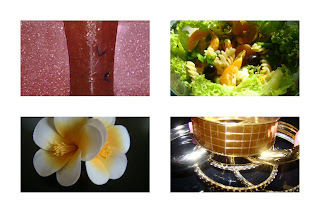 Grid View of beet dazzle,Mediterranean salad ,Frangipani fabric hair clip and gold&silver bangles.The picture and recipe of Beet Dazzle is courtesy of my blog reader Sireesha who is pursueing her Master's degree in biotechnology. Spring is around the corner and new life begins to slowly awaken and unfurl from the deep slumber of winter.Most of us like the season of spring as color begins to fill and surround our senses.So get ready to soak up the delights that this season has brought for you. Fashion: This season romance rules and is defined by clothes that are made of light and sheer fabrics, floral prints, drapes and ruffles, soft colors and monochrome shades of white and black.Denims in faded blue are also the rage. Accessories:If you love bags then the usual tones of white black and brown have got an extra edge with colorful embroidery and multicolor beads.Soft candy and forest colors are in too.Gold and silver has been the highlight from chunky bangles and cuffs,to bags and clutches and even strappy high heeled shoes.Flip Flops and sandals in bright colors are in and flowers cut out in fabric, seem to be the highlight of hairclips shoes and other accessories.Hair is either wavy or braided this season loosely pinned with hairclips in multicolored fabric flowers..think forest nymph or the beach babe look... need further elaboration ..like the hawain hula dancers wavy hair pinned with flowers. Nothing is complete without make up ... soft tones of blue,pinks browns and greens are trendy and don't forget turquoise/coral shades too.Flawless looking skin and barely there make- up are the key words.Jewellery is defined by beads, multicoloredstones and if you are an ardent lover of high-end jewellery them pearls and multicolored stones are the most happening... look for inspiration and help from Cartier, Piaget and Van Cleef & Arpells. Since this blog is basically about food , how can it be far behind...colorful fruits and vegetables that spring and summer have to offer should be big on the plates and your menus.Eating plenty of fruits and vegetable salads and of course fresh juices should help you detox- flush away the toxins from your system.Years ago I was influenced by the philosophy of detox and Living health ( Fit For Life 2 byHarvey and Marilyn Diamond).They advocate a living food day per week that is to eat only fresh fruit and vegetables which are living foods meaning in their natural state- uncooked.Celery, lettuce, cucumber,tomatoes which are rich in water content( highly fibrous vegetables are not advised) and of course fruits too.No cooked food is allowed on this day and if you must then only partake of a light clear vegetable soup in the evening for dinner.You can begin with one day and go upto three and then fifteen days of living foods as you progress.This gives rest to the digestive system from the effects of heavy processed and oil laden foods which form the usual diet of most people.It is also thought to help you lose weight. NB:However, before you embark upon a detox journey consult your GP especially people with specific medical conditions must not undertake any diet without consulting a doctor.This detox therapy is merely a guideline for you and expert advise should be taken before making any changes to your diet. Keeping in sync with this philosophy of light eating I am posting a vegetable salad and a nourishing drink which you might enjoy.The drink however is not intended for your living health programme but as a light and nourishing summer drink. Toss all ingredients along with cooked spiral pasta.Mix the dressing in a bowl and drizzle over the salad just before serving. Wash the beetroot and carrot blend well and sieve through muslin cloth to obtain a clear liquid.Mix this liquid with the sugar pellets and heat till it thickens to a slightly syrupy texture.Cool and store in refrigerator.To serve use 1/4 th glass of the syrup,top it with cold water add honey to sweeten and a few drops of lemon juice, stir well. This is best taken on an empty stomach first thing in the morning. Thank you priya.You know how we girls adore and soak up all the buzz of fashion thought I could write it down to help busy hausfraus..Loved the fact that you liked it.